Teething in babies is a natural process, which becomes an event of great excitement and anticipation for the parents and near and dear ones. The primary teeth start developing when the fetus is six months old. Teething is the emergence of primary teeth through the gums. In most babies, this starts happening when they are around six months old and may go on till they are three years. Teething may cause pain, irritation, rash or fever in some babies, making them fussy. However many of them go through this stage without much problems. Earlier, many old remedies like blistering, bleeding and lancing of gums and application of teething powders were tried to help the teeth to "cut" and emerge through the gums. In early twentieth century, many deaths of babies in their first year of life were wrongly attributed to teething and related diseases.The eruption of the tooth is promoted by the periodontal ligament. In fact, there is no 'cutting' of the gum in babies. There is shrinking and cross-linking of collagen fibers of the periodontal ligament and the contraction of the fibroblasts, making way for the tooth to emerge. Teething in babies generally starts from six months onwards. However there are many exceptions. Primary teeth eruption in some babies may start as early as three months. In some babies it may be delayed up to 18 months. Normally teething occurs in pairs and the lower central incisors emerge first. By the third year all the four incisors, four canines, four first molars and four second molars may complete eruption. From the sixth year onwards the primary teeth get gradually replaced by permanent teeth. Most of the babies may suffer from pain at least at some stage of the tooth emergence. In rare cases rash may occur around the mouth. There may be slightly elevated body temperature when the teeth emerge out of the gums. The intensity of pain and pain tolerance levels differ among babies. If there is obvious pain and continuous crying, baby-safe pain-relief treatments may be tried under the guidance of a dentist. Chewing cold objects and applying cold pressure on the gum may give temporary relief to the baby. Over-the-counter medicines should not be given to the babies. The risks and adverse effects from inappropriate medication may grossly outweigh the benefits in pain management. "Aspirin (acetylsalicylic acid) should not be given to babies and teenagers as it may cause Reye's syndrome, a rare but severe illness of brain and liver". The excessive drooling or dribbling during the teeth emergence may cause rash on the mouth, chin, face and chest. Frequent wiping of the chin and face may prevent the rash. Wiping must be done very gently as frequent wiping itself can cause rash in babies. Petroleum jelly may be applied on the rash for soothing the irritation. It will also function as a barrier cream. Rashes not connected to drooling must be investigated as they may indicate some other illness. In some babies there may be mild fever when the primary teeth emerge, which can be due to mild gum infections and trauma. It is estimated that 90% of the babies are infected by human herpesvirus 6 (HHV-6) by age two. The infection may take the form of gingivostomatitis causing high fevers and facial rash. 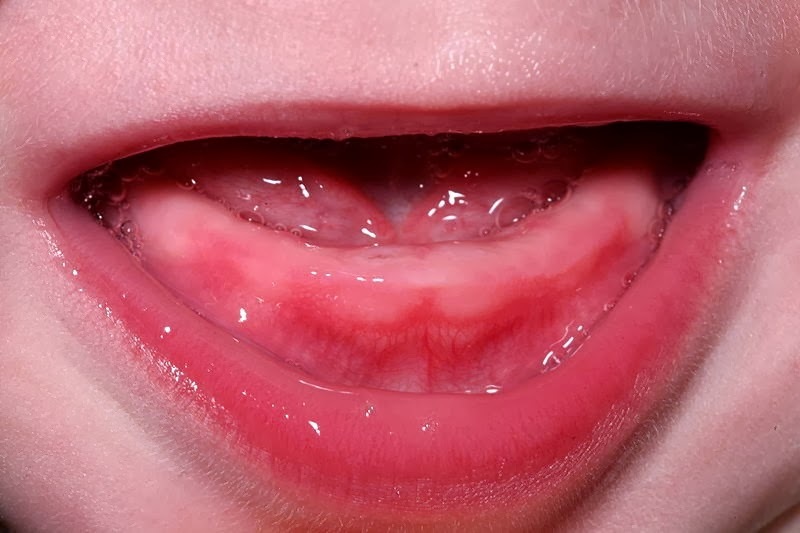 If the herpes infection occurs in a baby concurrently with teeth emergence, it is quite often misdiagnosed as teething fever. Delay in teething in babies sometimes runs in families. A pediatric dentist must be consulted if a baby has a toothless grin at 18 months. It could be a very normal delay without any medical condition. If the baby is malnourished and is underweight, the delay could be due to nutritional deficiency, especially of the vitamin D and calcium. Hypothyroidism, a medical condition, causes delayed emergence of primary teeth and delayed walking. 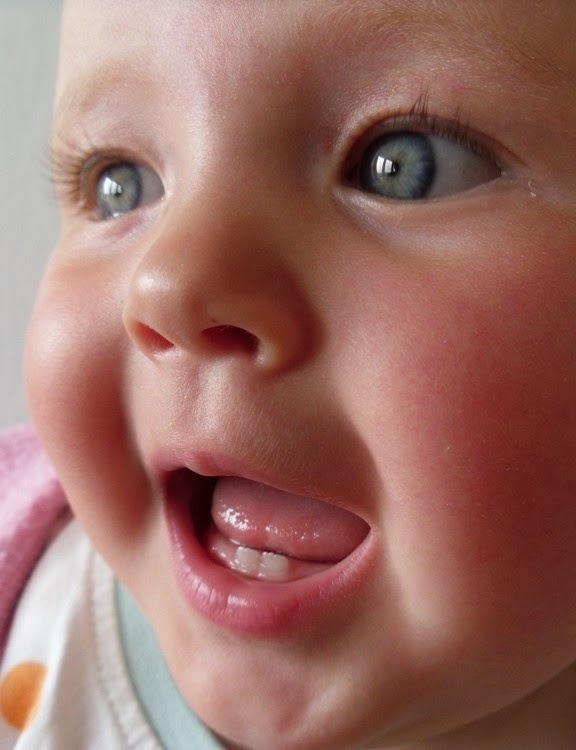 Some babies have teeth (lower central incisors) at the time of birth. They are known as natal teeth. They are relatively rare, occurring as isolated incidents. Natal teeth do not have root structure, are often wobbly and are loosely attached to the gums by soft tissue. Though generally harmless, sometimes they may be associated with a medical syndrome. Neonatal teeth are similar to natal teeth, but emerge during the first month. They may be left in the mouth as long as they are not causing difficulties to the baby or the mother. If the tooth is very loose, there is a possibility of aspiration by the baby and the tooth may be removed by a dentist. Do not try to pull it out as there is the risk of damaging the permanent tooth beds. The primary dentition is made up of twenty teeth; four central incisors, four lateral incisors, four canines, four first molars and four secondary molars. From the sixth year they are gradually replaced by permanent teeth. All the incisors and canines are replaced. However the first molars and second molars are replaced by premolars.